10 1/2 x 13 1/2 x 13 1/2 in. This work is inspired by the biblical story of the Tower of Babel in which the descendants of Noah attempted to construct an architectural marvel in order to reach the heavens. Their arrogance enraged God, who punished them by making them speak different languages, leading to the collapse of the tower and ultimately creating indigenous nations throughout the world. 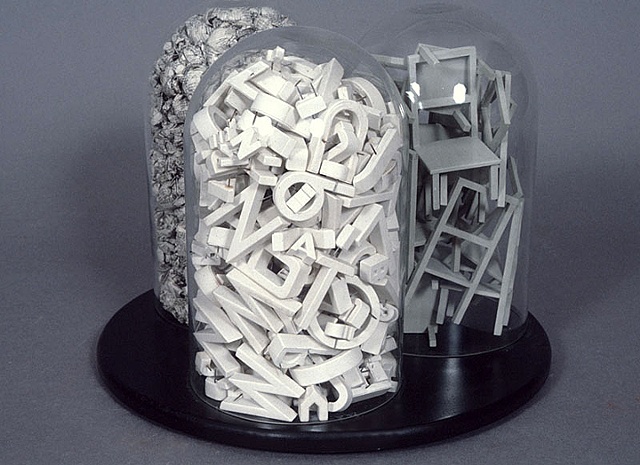 Symbolizing this tale of national, racial, and linguistic diversity, three glass bell jars are filled with a heap of ceramic letters, crumpled pages from a Brooklyn residential phone book, and miniature wood chairs, respectively, which spill out onto the surface when the jars are removed. Rather than submit to the fallen notion of the materials, viewers are invited to empower themselves by building towers through their own storiesarranging the ceramic letters to make words or sentences; stacking the chairs in free-form shapes that create their own architectural marvels; and flattening the crumpled balls of newsprint to reveal a babble of names from around the globe, all legible in their differences to the tolerant eye.